For many people, passing on money and property to their loved ones happens after they die. However, if you have a sizable estate, you may not want to wait until then to give your heirs their full inheritance. Under current federal law, individual estates valued above $10 million or $20 million per couple (indexed for inflation each year through tax year 2025 – so for 2018, the amounts are $11.2 million and $22.4 million, respectively) are subject to a 40 percent federal estate tax at the top rate. Strategic lifetime or inter vivos gifting can reduce the size of your taxable estate before your death, and help your beneficiaries avoid this hefty financial burden. Qualified gifting is the complete and irrevocable transfer of assets from one person to another, where the giver does not receive anything in return. Certain IRS exemptions allow you to make these gifts completely tax-free, provided their values fall within the federally allowed limits. Going above these allowable amounts means that you, as the giver, are obligated to report the gift to the IRS and pay a federal gift tax. 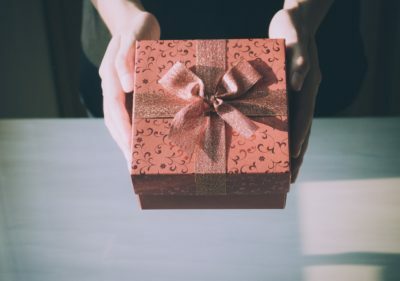 If you plan to use gifting as an estate planning tool, you’ll want to plan out your giving and time it properly, so you and your loved ones can avoid as much estate-related taxation as possible. Here is a basic overview of annual and lifetime gifting exemptions, and how you can make the most of them. For tax year 2018, the annual gift tax exclusion allows you to give any single individual up to $15,000 per calendar year, tax-free. That means if you have three children and give each of them $15,000 this year (or $30,000, if you are married and you and your spouse “split” the gift), you do not need to pay gift tax. However, if you give one child $16,000 in a single year, $1,000 of that is considered taxable, and counts against your allowable lifetime gift amount (see below). By the same token, your recipient does not have to report annual gifts under $15,000 as income, but they must report any income or interest earned directly from that gift. The lifetime gift tax exemption is connected to the estate tax exemption: The $10 million limit is the combined amount that you can give away prior to death and leave to others after death, without being subject to federal taxes. This means that if you give away $5 million in non-exempt gifts while you’re alive, only $5 million of your remaining estate is tax-exempt, and your estate must pay taxes on anything beyond that amount. If you are married at the time of your death, your surviving spouse is entitled to their own individual exemption plus any of your unused exemption, if you properly invoke portability in your estate plans. You must also consider that the estate tax exemption is currently set to return to its previous $5 million individual limit in 2026. If you are young and unlikely to pass away before then, you’ll want to adjust your gifting plans accordingly. Marital gifts. If both spouses as U.S. citizens, they can make unlimited lifetime gifts to one another without paying taxes on those gifts. Medical and educational gifts. Payments made directly toward a dependent-beneficiary’s medical services or education (e.g. tuition expenses) is not included in your lifetime gifting amount. Charitable gifts. You do not have to pay gift tax on gifts given to qualifying organizations like charities, religious or educational institutions, government agencies, and 501(c)(3) tax-exempt organizations. You can learn more about gifting, including specific information about the state laws in Virginia, in our blog post. Talk to an estate planning attorney about gifting. If you’re considering making gifts to reduce your taxable estate, it’s important to speak with an experienced attorney who can educate you on federal gift tax laws and other implications of lifetime giving. You can also work with your estate planning lawyer to create a strategic gifting plan that reduces your taxable estate while leaving you enough to support yourself. The Law Office of Patricia E. Tichenor, P.L.L.C. has been assisting Northern Virginia individuals with their estate plans since 2001, and we’d love to help you create the best strategy for your family’s future. Contact us today to talk about your unique estate planning needs. The Law Office of Patricia E. Tichenor, P.L.L.C. Trish’s work was professional, complete, on time and the cost was reasonable and fair.